Industry pays tribute to Liebherr’s Darren Bennet who has sadly passed away. 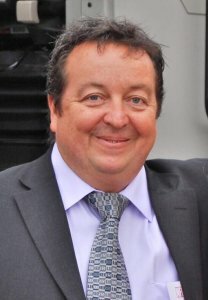 The UK demolition industry is mourning the sad and premature passing of Darren Bennet; a man whose name became so synonymous with the equipment brand he represented loyally for many years that he was rightly dubbed “Mr Liebherr”. His business card said he was a National Accounts Manager which is just a fancy way of saying he was a digger salesman. The fact that his passing has impacted the industry so deeply speaks to the fact that he was way more than that. He was a keen and generous supporter of both the National Federation of Demolition Contractors and the Institute of Demolition Engineers. He was ever-present. He was a still point in an ever-changing industry. And he accomplished all this while being a single parent following the premature passing of his wife several years ago. As a business, Liebherr prides itself on being a family-owned and family-run company with all the values, ethics and traditions that implies. Darren Bennet was a member of the Liebherr family in as much as the company employed him. Yet he exemplified all those qualities. He was at home negotiating multi-million pound deals with the owners of huge demolition companies. He was at home with the operators sat behind the levers of a Liebherr machine. He was even liked by his rivals and by his peers. As news of his untimely passing spread, Worsley Plant’s Sean Heron tweeted that Darren Bennet was “a larger than life character who touched everyone. Great storyteller, listener and friend to many”. Liebherr makes some of the finest equipment in the field of demolition and construction equipment. But make no bones about it. The fact that Liebherr excavators are used so widely in the UK demolition business owes as much to Darren Bennet’s personality as it does to the engineering excellence built into the machines. Someone will, of course, step into his role at Liebherr. There is a possibility that they might even fill his shoes. But future meetings of the National Federation of Demolition Contractors and the Institute of Demolition Engineers will be diminished by Darren Bennet’s absence. Posted: January 27th, 2019 under General, People.